The Grizzly Bear. Powerful. Dangerous. Magnificent. The unpredictable Grizzly Bear is a resident of the mountains and valleys of the Whistler Corridor. These great wild animals are true survivors. 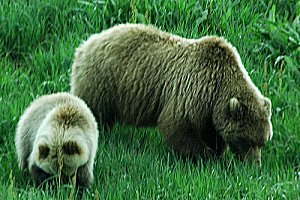 Irma and I have never met up with a grizzly bear while on foot, however, we had the opportunity to watch one close up along the Alaska Highway in 2010.It was magnificent. Most of us have seen them on TV when they are shown fishing at the many waterfalls in Alaska. That’s all and fine but when food is scarce or you are in the vicinity of a fresh kill, or worse still, a cow with cubs is nearby, you may be in grave danger. If you are traveling in bear country you muat carry a GPS unit. You may not think you will need one but if you are in bear country you may need to leave the safety of the trail and hitail it across country. Your GPS could save your life. A few years ago, Irma and I had an opportunity to visit the Sheep Mountain area in the Kluane National Park in Canada’s Yukon Territory. We visited the Visitor Center there and decided to hike up to the top of the mountain the next day. The kind lady there advised us to be careful to make plenty of noise on an area of the ten hour hike because a female grizzly bear with cubs was seen a few times in that area. During July in that area the daylight is prevalent for about 21 of the 24 hours in a day. We had trouble sleeping in our tent as it was so bright. We set off on our hike early in the morning from the parking lot on the Slims River. The first part of the hike took us along a roadway at the side of the river, then along the highway for a mile or so where we found the trail head. The hike was quite steep with many switchbacks. The elevation gain was about 3,500 feet. All the way up the trail the ground was torn up by Grizzly bears as they searched for ground squirrels. Here was proof of the power and determination of these magnificent creatures. Some of the holes were three feet deep and seven feet wide. Mounds of earth were everywhere. It’s amazing the work they will do in their attempts to find a small little animal. Here you will view over 800 beautifully detailed photos by some of the worlds foremost outdoor photographers. These wild and adaptable creatures live with us but keep their distance. Click on the photo to view or purchase these magnificent photos. We arrived at the summit of Sheep Mountain and sat down to have our lunch. 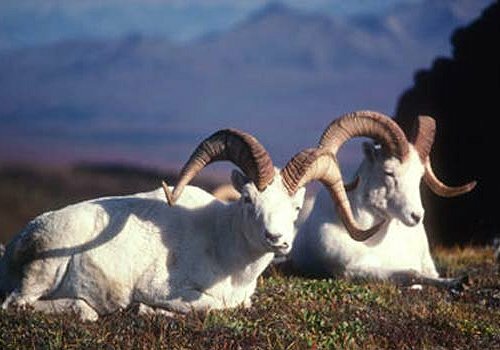 Dall Sheep were everywhere. We counted over 100 animals. The males with their curling horns were in a group while the many females and their kids were separated and scattered. The Kluane lake itself was beautiful with huge white fluffy clouds reflected from the emerald green waters. In every direction were snow capped mountain tops. Way off in the distance up the Slims river valley we could see the amazing Kaskawulsh Glacier. From 22 km away it was still a beautiful sight. We spent the afternoon winding our way down to the valley to the west passing creeks with amazing displays of wild flowers. We entered the canyon where the grizzly bear with cubs was living and used our cooking pots and spoons to make as much noise as possible. With warning, Grizzlies will leave the area. Surprise them and you will be treated quite differently. We didn’t see the bears but we did see plenty of tracks along the old roadway we had found. We found our way back to our vehicle, tired but thrilled with the memories of a fantastic adventure. One of the best 10 hour hikes ever. If you ever get the opportunity to do this one. 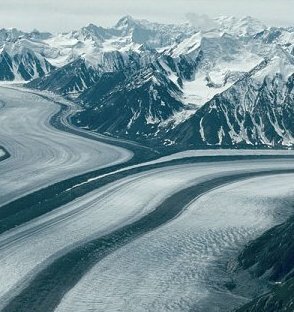 By the way, the Kaskawulsh Glacier hike is one that leads up along the Slims River for 22 km from the Visitor center. 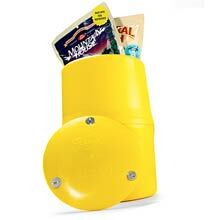 It’s a tough one as you will need to cross ice cold creeks and carry a bear safe container (available at the center). You cannot go without one. 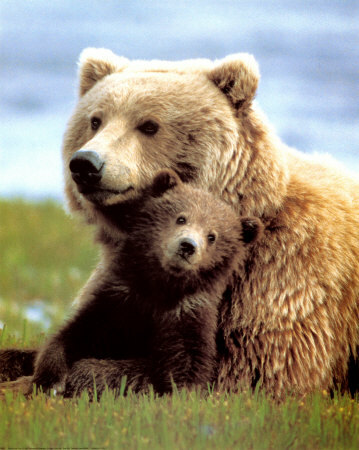 The Grizzly Bear can be identified chiefly by the hump behind the shoulders. They are usually brown in color as opposed to black for the black bear. Other colors may be, pale to dark black, fawn and reddish color. If you meet a grizzly bear, or any other wild animal DON’T RUN. That’s the last thing you should do. Running triggers the pursuit in a wild animal. If the bear has not charged, back off very slowly but keep facing the animal. Be careful not to trip while creeping backward. Any sudden movement may trigger a charge. Space will be to your advantage. I repeat DO NOT RUN. Slowly get out if the territory. If the bear attacks, get on the ground in a fetal position and get your head protected with your arms. If you get a chance, get your thumbs or fingers into its eyes. Eyes are the most vulnerable areas on the body. Gouge them out if you can. It will be you against a wild beast. It’s do or die time. It is not the time to be gentle. OTHER SUGGESTIONS WHILE IN BEAR COUNTRY. All bears love food. It’s up to you to keep them from it. In the Kluane Park they have food carriers for hikers to carry their food in bear proof containers. They were made of heavy PVC. The one pictured here is from a company that makes bear proof food containers. Even though your food in kept in this container it’s still a good idea to not keep it in the tent. Sling it between two trees as described here on our page on Black Bears. Of course your chances of meeting up with a grizzly are slim. If you are alert, cautious and use a noisemaker while traveling on foot in the thick brush area you will probably live to do so for many years to come.